NYX Cosmetics Butter Lipstick in Licorice is one of my recent lipstick additions and it's a dark plum that is more purple and has hints of red. NYX claims that the texture melts into the lips while giving high pigmentation. I wanted to go darker, but straight up purples are too scary for me right now. It contains 0.16 ounces / 4.5 grams the retail price is around $5 - $6. I very much agree with NYX and that the texture is amazing. It feels lightweight on the lips and it is so pigmented. It will transfer though if you're careful. I touch my lips a lot and so I sometimes get a bit of lipstick on my hands or around my lips. The lipstick has a satin finish and it stays that way. I've worn it for at most 7 hours and it stayed perfect through that. There wasn't any feathering or bleeding though and so you can skip out on lipliner. Even with different hair colors, the color still matches me. I think it goes better with my cooler toned hair, but it doesn't look bad paired up with my blonde hair. I didn't notice any strong fragrances, but if you really take a whiff, it smells slightly artificial. There is pretty much no smell though. The packaging matches the color of the lipstick and so if the lipsticks were sealed up, I would just trust the packaging to tell you the correct color. In the tube, there are some micro shimmers but that doesn't translate onto the lips at all. Final thoughts: I'm so glad that I got this lipstick for me and another one for my sister. It's perfect for fall / winter, but I think if you sheer it out a bit, it can still look great all year round. It lasts a really long time on me without signs of fading, but I just have to be careful about touching my lips because it will transfer. It does fade faster if you eat or drink. I highly recommend this color and now I'm looking forward to get different shades in this line. It looks really lovely on you! For some reason, I thought it would be a bit darker. Thank you! I thought it would be darker too. My skin looks a bit washed out, but the lipstick color looks pretty close in person. It might be a smidgen darker though. For a person that's venturing into darker and more purple lipsticks, it's great for me but not those who want really dark and vampy lips. I think I need to pick up some NYX Butter Lipsticks! 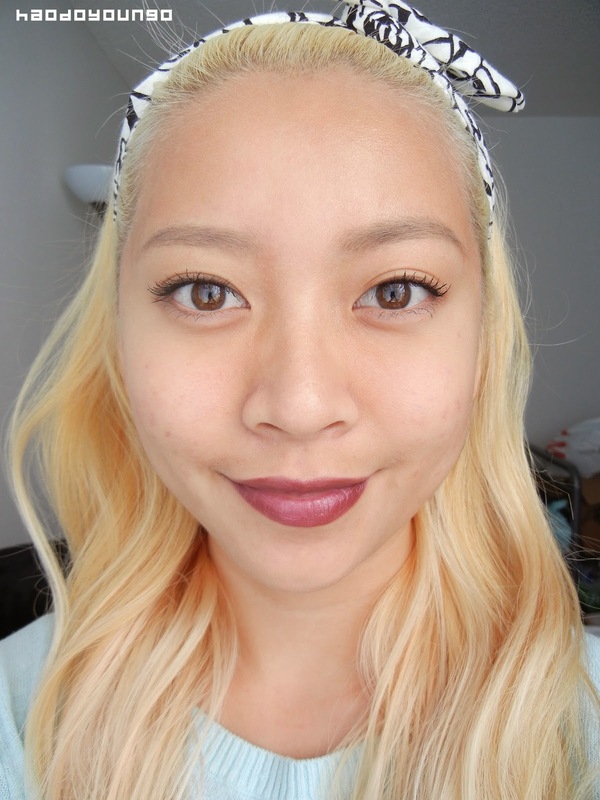 I've tried a different NYX lipstick before and I was not impressed. Maybe I'll like these though. I had Snow White and Haute Melon. Snow White is absolutely amazing but Haute Melon was so bad and patchy. I buy a lot of their lip pencils though and I also love those! This lipstick is freaking gorgeous! You have no clue how many times I've put this into my cart and then didn't buy them! I would love to own two or three shades from them but everytime the shades I want are out of stock on our local sellers site! grrr! I would love to try them! I'm not saying that you neeeed it... but you NEED this shade! It would look so beautiful on you!! My sister came over last night and after feeling my hair, she said it feels grossly dry.... She mostly said it to make fun of me though. hahaha It is a lot dryer than my natural hair texture, but I don't think it's that bad. I put on plenty of oils and deep conditioners though. Okay thanks for the informations!! :) Oh yes Hyosung is a goddess!! She is so beautiful! Tag: The Jolly Blogger Award! October & November 2014 Favorites!